I must admit, my early morning seat felt a little bit out of place. After all, a heavily camouflaged waterfowl layout blind – something I’m entirely familiar with in December and January – is a bit of an unusual hide for a September wingshooter in North Texas. Especially when that blind is surrounded by a sea of Canada goose decoys, in this case several dozen Real Geese and Jenny Vane silhouettes poked into the hard, dusty layer of Texas topsoil. 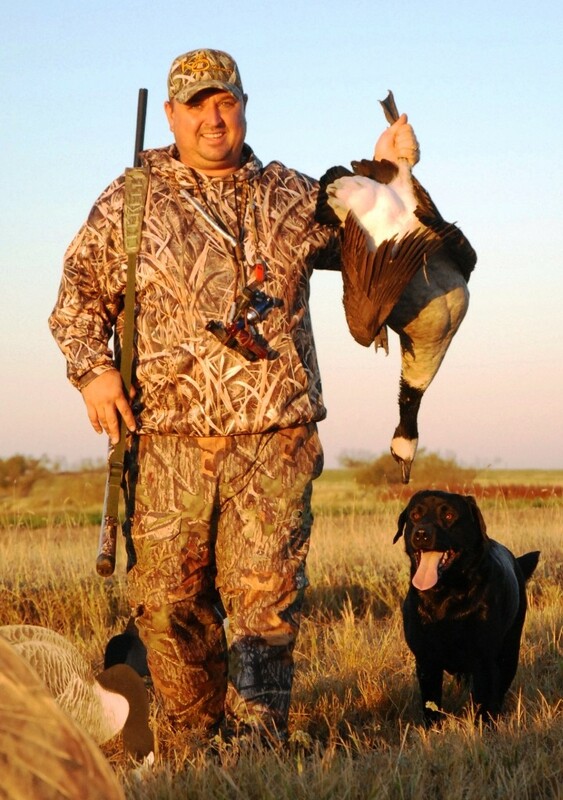 North Texas waterfowl outfitter J.J. Kent shows a September honker taken during the early Canada season goose season. Before the day was done, Kent’s Labrador retriever Bo had fetched a three-man limit to hand. But out of place or not, there I was a few mornings ago, wiping sweat from my brow, anticipating the aerial show to come. A show that I hoped would materialize after the pre-dawn ritual of setting out a big goose spread, positioning blinds for close quarters shooting, and camouflaging those dirt-encased hides with layers of stubble designed to keep prying eyes of overhead geese from getting too wise on final approach. Unlike the usual September fare of mourning doves and early teal, on this particular morning, the hopes of Pottsboro waterfowl guide J.J. Kent (http://www.kentoutdoors.com/ , 903-271-5524), his guiding sidekick Kelly O’Neill and yours truly were to dupe a three-man limit of early season Canada geese that had made a recent habit of feeding in an old, dry stubble field. That we were hunting such geese in a field wasn’t surprising since the Lone Star State annually winters literally hundreds of thousands of the gray birds with the familiar black heads and gaudy white cheek patches. From the small lesser Canada’s that flock into the Rolling Plains near Knox City, Haskell, and Benjamin to the flocks of even more lessers – and a fair smattering of the larger greater Canada’s – that wing their way over the playa lake studded Texas Panhandle, there is no shortage of Canada geese in the state each fall. That’s true even here in North Central Texas where tens of thousands of Canada’s once wintered around Lake Texoma back in the 1960s, 1970s and early 1980s before local peanut farming disappeared. While the Canada goose flocks in the Texoma region are much smaller now, the birds are still a somewhat familiar sight in the fall and winter months. Familiar, that is, unless you’re talking about seeing them fly over a September decoy spread. That’s what we were hoping for this week, hunting these birds (which are legal game in the state’s eastern goose zone this year from Sept. 14-29) thanks to the recent increase in numbers of Texas born and bred Canada geese. Some of those building numbers are due to migratory birds deciding to stick around all year while other flocks are building after introductions of Canada geese to golf courses, small rural lakes, and urban city park waters. In most cases, those introductions have gone well and in a number of cases, they have gone too well. Here in Grayson County there are at least a few hundred Canada geese – perhaps even many more than that – that live year round on Lake Texoma, other small area lakes and on some local farm ponds. In a number of other North Texas counties, sizable groups of Canada birds continue to build there on various water bodies with flock numbers expanding every year. “Resident Canada geese are found along the Red River as far up as Wichita Falls, with concentrations on Lake Texoma,” said Kevin Kraai, the waterfowl program leader for the Texas Parks and Wildlife Department, in a Houston Chronicle interview a couple of years ago. How many resident Canada’s live in Texas? According to at least one written report I have seen, TPWD estimated two years ago that there were approximately 15,000 to 20,000 resident birds. There are more now – perhaps a good number more – since the resident populations in Texas continue to grow. Thanks to this increasing supply of resident birds, TPWD – with federal approval – opened a special two-week long early Canada goose season in September 2011 in an effort to try and keep the population in check. Until the other day, I had never participated in such a September early Canada goose hunt, which features a daily bag limit of three. But that all changed when Kent called the other evening and said that he and O’Neill – who have enjoyed several limit shoots over the last couple of seasons – had found yet another opportunity to call in some flocks of the big early birds. After setting out our spread the following morning, the three of us sat back in the blinds and waited to see if the various flocks of Canada birds roosting on a nearby sizable lake would fly out and feed in our vicinity once again. Less than a half-hour after shooting time, O’Neill heard goose music on the wind and hissed for us to get down. We closed the lids on our blinds, grabbed our shotguns loaded with heavy loads of non-toxic shot, and begin making a cacophony of goose noise with the Zink goose calls dangling from the lanyards draped around our necks. As several flocks approached – and the noise built to a loud crescendo overhead – the first wave of geese passed by low, circled out wide, and then committed to the spread as they began backpedaling into the landing zone that we had created in front of our blinds. Despite the chaos and confusion that came as the scatterguns barked and the big birds realized that they had been duped, we still managed to knock down a few birds from the first flock. But not the limits that we were hoping for. Especially since such early season Canada goose hunting can be a one-and-done type of deal. Moments later, however, we were offered yet another chance as a new but smaller flock appeared on the horizon, circled low, responded to our calling, and dropped feet first into the landing zone. This time, more of the big geese in the seven to twelve-pound range stayed behind and we moved even closer to our early season limits. After that, there was a short lull in the action, something that wasn’t surprising since we were hunting September’s resident birds, not migrating flocks riding a north wind later in the fall. But just as we opined that perhaps we were done for the day, O’Neill hissed again and we dove back under the cover of our layout blind lids. Just in time, it turned out, as a flock of three Canada geese approached from high overhead; responded to our pleading hail calls, moans, and clucks; and dropped like rocks straight down out of the sky into the center of the spread. When the call came to “Get ’em!,” O’Neill anchored a bird on the left, Kent centered the middle bird, and I upended the bird on the right. And just like that, we were done with a limit of early season Canada geese in Texas. As Kent’s retriever Bo raced out to try and bring the hefty geese to hand, we all looked at each other and smiled with grins as big as the Lone Star State is wide. Because in a September that has been anything but filled with bird hunting success, we had ventured forth and found a ringside seat to enjoy one of the state’s newest – and most enjoyable – early autumn wingshooting shows. A show that is tailor made for the big early birds that fill Texas skies each fall with their wild and haunting melodies.